Australian brides form friendships as they make their way to England aboard an aircraft carrier in this novel, originally published in Britain in 2005, from Moyes (Silver Bay, 2014, etc.). After World War II ends, more than 600 Australian brides are traveling to join their husbands in England. But the Victoria is no luxury liner—it's an aircraft carrier, and it's also full of naval officers. 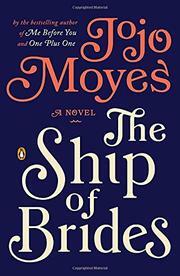 The novel follows four roommates (a pregnant farm girl, a social striver, a loudmouthed teenager and a quiet nurse) as well as some of the ship’s men as secrets are revealed and true friendships are slowly formed over the six-week voyage, but not every woman is lucky enough to get a happy ending. The troubles the characters face are not always due to marrying faraway men during wartime; their problems are often caused by the lofty expectations and limited roles forced on women in the 1940s, and this well-researched novel shines a light on women's postwar lives. In this world, men are able to have full lives and consequence-free extramarital dalliances, but even the intimation of an affair is enough to ruin a bride’s life. Although focusing on so many characters could easily have become overwhelming, Moyes masterfully balances their stories. The book drags in parts, and the largely unnecessary frame story is easily forgotten, but those are small complaints. Moyes creates characters full of warmth and heart, and readers will find themselves swept up in this quiet, emotional story. Moyes' fans won't be disappointed with this altogether pleasant voyage.